Overview An Achilles tendon rupture is when you tear the tissue that connects your calf muscle to your heel bone. Your Achilles tendon is very strong and flexible. 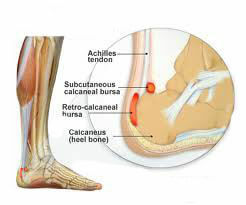 It?s at the back of your ankle and connects your calf muscle to the bone in the heel of your foot (calcaneum). If you rupture your Achilles tendon, you can either partially or completely tear the tendon. Most people who injure their Achilles tendon are between 30 and 50 and don?t exercise regularly. It?s more common in men but can affect anyone. It happens most often in the left leg. This may be because most people are right-handed which means that they ?push off? more frequently with the left foot when running. Causes As with any muscle or tendon in the body, the Achilles tendon can be torn if there is a high force or stress on it. This can happen with activities which involve a forceful push off with the foot, for example, in football, running, basketball, diving, and tennis. The push off movement uses a strong contraction of the calf muscles which can stress the Achilles tendon too much. The Achilles tendon can also be damaged by injuries such as falls, if the foot is suddenly forced into an upward-pointing position, this movement stretches the tendon. Another possible injury is a deep cut at the back of the ankle, which might go into the tendon. Sometimes the Achilles tendon is weak, making it more prone to rupture. Factors that weaken the Achilles tendon are corticosteroid medication (such as prednisolone), mainly if it is used as long-term treatment rather than a short course. Corticosteroid injection near the Achilles tendon. Certain rare medical conditions, such as Cushing?s syndrome, where the body makes too much of its own corticosteroid hormones. Increasing age. Tendonitis (inflammation) of the Achilles tendon. Other medical conditions which can make the tendon more prone to rupture, for example, rheumatoid arthritis, gout and systemic lupus erythematosus (SLE) - lupus. Certain antibiotic medicines may slightly increase the risk of having an Achilles tendon rupture. These are the quinolone antibiotics such as ciprofloxacin and ofloxacin. The risk of having an Achilles tendon rupture with these antibiotics is actually very low, and mainly applies if you are also taking corticosteroid medication or are over the age of about 60. Symptoms Symptoms include a sudden sharp pain in the achilles tendon which is often described as if being physically struck by an object or implement. A loud snapping noise or bang may also be heard at the time. A gap of 4 to 5 cm in the tendon can be felt which may be less obvious later as swelling increases. After a short while the athlete may be able to walk again but without the power to push off with the foot. There will be a significant loss of strength in the injured leg and the patient will be unable to stand on tip toes. There may be considerable swelling around the achilles tendon and a positive result for Thompson's test can help confirm the diagnosis. Diagnosis The actual area of an Achilles tendon rupture cannot be seen on x-ray. Therefore, although x-rays are often done to rule out bony injuries in individuals with an Achilles tendon rupture these x-rays are usually normal. Diagnostic ultrasound of the tendon can be performed to assess the integrity of the tendon. Other diagnostic tests, such as MRI's, may also be required in difficult cases. Non Surgical Treatment There are two treatment options available which are non-operative and operative. Non-operative treatment involves the use initially of a below-knee plaster with the foot held fully bent downwards. This usually stays in place for 2 weeks then is changed for a brace(this is a boot from the knee down to the toes with Velcro straps) which should be worn day and night. The brace will be regularly altered to allow the foot to come up to a more neutral position. The brace will be on for a further 6 weeks. After the 8 weeks you will be referred for physiotherapy to regain movement and calf strength but will probably need to wear the brace during the day for a further 4 weeks. Non-operative treatment avoids the risks of surgery but the risk of the tendon re-rupturing, which normally occurs within 3 months of discarding the brace, is 10%. Surgical Treatment Surgery offers important potential benefits. Besides decreasing the likelihood of re-rupturing the Achilles tendon, surgery often increases the patient?s push-off strength and improves muscle function and movement of the ankle. Various surgical techniques are available to repair the rupture. The surgeon will select the procedure best suited to the patient. Following surgery, the foot and ankle are initially immobilized in a cast or walking boot. The surgeon will determine when the patient can begin weight bearing. Complications such as incision-healing difficulties re-rupture of the tendon, or nerve pain can arise after surgery. rivkatoplk is using Hatena Blog. Would you like to try it too?